A pipeline, which conveys foul sewage and/ or surface water run off from a single property into a public or private sewer. It is usually of small internal diameter. What is a lateral drain? 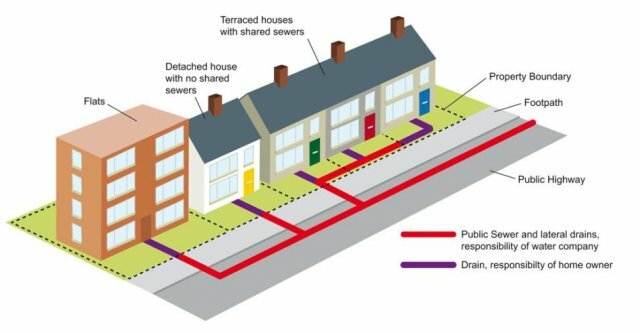 A Lateral Drain is a Drain as described above that is outside of the property boundary of the property whos sewerage it carries. Lateral Drains now form part of the Public Sewer. A pipeline, which normally conveys foul sewage and / or surface water run-off from two or more properties. The responsibility for drains and sewer pipes that remove waste water from your home may be in public or private ownership. The large sewers that are normally situated under the road are usually maintained by the sewage undertaker and are known as public sewers. If the ownership is not public ownership then it is private. It is important to understand the different definitions of pipework. Responsibilities are different with each type of pipe. If you own the house you are responsible to clear and repair the drains, gutters and rain water pipes. If you are a tenant the landlord may be responsible. A sewer which has been adopted as a public sewer, which carries waste water from two or more properties built before 1 October 1937 (with some exclusions) Public sewers in North West Leicestershire District are usually under the highway and are the responsibility of Seven Trent water. What can you do if you have a problem? Usually most drainage problems are a simple, one off blockage that once cleared will cause no further problems. First you must establish who is responsible for the pipe where the blockage starts. Pumping stations, unlike sewers and lateral drains did not transfer overnight on 1 October but will transfer later. All pumping stations that are eligible for transfer will do so by 1 October 2016. If you have a blocked drain, which is the responsibility of the owner of the property, you may wish to try and unblock the drain yourself. A set of drain rods will usually be sufficient to clear the blockage, these can be hired from tool shops. If you decide to do this yourself you need to be careful that you do not damage the pipes in anyway. Alternatively you may prefer to pay someone to do the works for you, you can find specialist firms in the yellow pages. If the blocked pipe or problem is originating from a public sewer, report it to Severn Trent or call 0800 783 4444. What if the problem occurs again? This may be due to unsuitable items being flushed into it - such as disposable nappies, sanitary towels or large amounts of grease. So please don't put them down the pipe! Also it may be due to a defect in the pipe work - such as a collapsed pipe, bad joint, tree roots growing in the pipe, etc. If this is the case the affected area of pipework may have to be dug up and re-laid. This can be expensive but may be covered by your house building insurance. You may wish to have a CCTV survey carried out of the affected pipework to identify the location and nature of the problem.